Thanksgiving might be my favorite holiday. But being an American living in New Zealand makes Thanksgiving a bit of a challenge – especially getting hold of a turkey. There’s just not that much demand for it here, which means if you want a nice big turkey for Thanksgiving dinner, you have to special order it from a farm several weeks in advance. Throughout this whole Thanksgiving prep process, I’ve been wondering about turkeys – wild ones, that is. What’s the deal with the brightly colored mess of skin on their heads? Where are they from? What do they have to do with the country that’s home to Istanbul (not Constantinople)? And why on earth did Benjamin Franklin want the turkey to be the national bird of the United States? Turkeys, or Meleagris gallopavo, are the heaviest kind of galliformes, a group of birds that includes chickens, quails, grouse, pheasants, and peafowl. They’re also some of the closest living relatives to dinosaurs like the T. rex. They’re quite large – wild males can be up to 1.25 m tall (or 4 feet), and can weigh as much as 11kg (24 pounds), although domesticated turkeys are often bred to be much heavier. Adult males, known as toms, have large fans of tail feathers that they display like peacocks do, a whole bunch of lumps on their featherless heads called caruncles, a “beard” made of modified feathers, and a dangly flesh flap over their beak called a snood. Toms use their fancy headgear to show off to females, and their heads change color with their mood. Their heads may not be pretty, but their plumage is gorgeous with a mix of reds, browns, purples, greens, and metallic tones like bronze and gold. Females, or hens, are smaller and have a more grayish color scheme. While the ladies still have throat wattles and bare heads, they don’t have all the extra skin decorations. And while they may look fat, wild turkeys can fly, and fly pretty well at that (although domesticated ones can’t). Wild turkeys can be found throughout most of the US, parts of Mexico, and southeastern Canada. So why the heck do they share a name with a country on the other side of the Atlantic ocean? It’s not entirely clear, but in a nutshell, it’s because of Turkish merchants and traders. 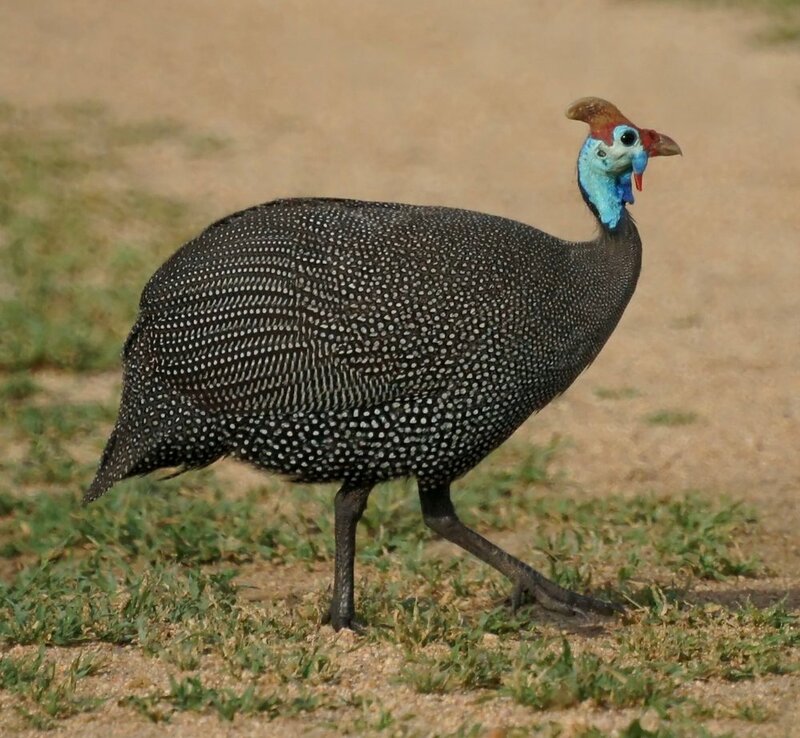 One theory posits that early European Settlers in North America confused wild turkeys with guinea fowl, an African bird like the one on the left, which were regularly imported into Europe by Turkish merchants from the Ottoman Empire. Another claims that wild turkeys were brought to Europe by Turkish merchants. Either way, Europeans started calling the birds "Turkey fowl," which eventually got shortened to just "turkeys." The country's name came first - then the bird's. The US National Seal might have looked like this! Art by Anatole Kovarksy, from the New Yorker Cover Archive. Speaking of countries and birds, the US is of course best known for the iconic bald eagle. But founding father Benjamin Franklin did not like being represented by “a Bird of bad moral Character,” as he wrote in a letter 1784. He describes eagles as lazy, cowardly thieves. But then old Ben goes on to say, “For in Truth the Turkey is in Comparison a much more respectable Bird, and withal a true original Native of America... He is besides, though a little vain & silly, a Bird of Courage, and would not hesitate to attack a Grenadier of the British Guards who should presume to invade his Farm Yard with a red Coat on.” This even came up in the musical 1776 – there’s a great scene where Ben Franklin, John Adams, and Thomas Jefferson argue about what bird will represent their new country. While the song may not be accurate, Ben’s description of how aggressive turkeys can be is spot-on, as the residents of Brookline, Massachusetts can tell you. So while you’re enjoying Thanksgiving dinner this year, be sure take some time to appreciate how weird and wonderful wild turkeys are. They may not be pretty, but they’re pretty freaking cool animals.